Gilbert Gramophones were produced between the years of 1922 to approximately 1931. Built by Master Craftsmen and featuring patented designs and innovations which were at the forefront of gramophone technology during the 1920's, they were considered to be of a high quality at the time, with unsurpassed sound reproduction and tonal qualities far greater than those of their competitors. Despite the use of proprietary parts such as Garrard motors and turntables, readily available needle cups, brake mechanisms, and speed adjusters etc, the Gilbert gramophone was unique for its use of the patented "Bugle" shaped tonearm, a "Mother-of-pearl" faced soundbox, which was named the "Tone Reflector" and a deep "Saxophone" shaped internal horn which resulted in impressive sound reproduction! Either opening or closing the front door(s) to the cabinet regulated the volume!! An extract from "The EMI Collection" by Ernie Bayly states: "The Gilbert Tone Reflector" and aluminum diaphragm and mother-of-pearl facing, and the "Bugle-shaped" Tonearm to which it was connected by a rubber flange, were patented by a Mr C. G Hibbard in 1926 & 1927". A selection of various soundboxes can be found in the gallery section of this site. An extract from the book: "Collecting Phonographs & Gramophones" by Christopher Proudfoot, states-"Gilbert, the Sheffield firm was active before the Great War, but is best known for its cabinet gramophones of the late 1920s; these incorporated a bugle-shaped tone-arm, a mother-of-pearl faced soundbox, and on some late models, a small electric light mounted on the arm to illuminate the needlepoint. Geisha portables, which were well made if unexciting, also achieved fairly wide sales". 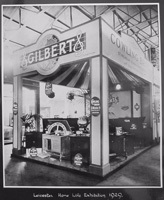 The Gilbert name was derived from the middle name of the company's founder, Mr Charles Gilbert Hibbard, who rearranged his initials to call the company "C. H. Gilbert" & Co. I am indebted to his granddaughter, J. L. Holdsworth, from the Isle of Man, for this information. An extract taken from a Cowling Bros advert from December 1930 states "The new GILBERT has set a higher standard in Gramophone Reproduction. Wonderful Volume and definition of tone is the secret of the new Gilbert's popularity. You must hear it. It is designed and built by Master Craftsmen-a marvel of engineering skill. These instruments are entirely free from distortion and vibration. Enjoy for yourself the smooth roundness of Gilbert reproduction-- perfect tonal balance is assured by the new Patent Tone Arm and Amplifier. The elimination of harshness is complete"
Gilbert "wind-up" gramophone production eventually ceased at the end of 1931, due to the increasing availability of electrically operated gramophones, but, according to company documents dated 1937, the company stated that it's prime business was still "GRAMOPHONE MANUFACTURERS, RADIO AND ELECTRICAL DISTRIBUTORS". I have no information about, nor any examples of Gilbert gramophones built after 1931. What is apparent is that the company continued to build and retail radios, namely the "Gilbert A50" model, and the "Gilbert A63" model, and sold electrical components, including valves, resistors, aerials, and cabling etc. The company also dropped the initial "H" from the company title of C. H. Gilbert & Co Ltd, to become simply: C. Gilbert & Co Ltd. Recently, I obtained an unusual (and previously unheard of!) Gilbert product--a paper wrapped razor blade, still using the "globe" trade mark, with a simple musical note super imposed across the front. Hopefully I will have some photos of this item on the website in due course. Sadly, I was informed a few months ago, that Lyndsay Holdsworth (grand daughter to Charles Hibbard, company founder) died at her house on the Isle of Man. Lydsay was a mine of information about her grandfathers business, and provided many artefacts, and anecdotal information that has been used in the making of this website. My condolances go to her remaining family members. From 1931 to 1936, company documentation confirms that the company had radio and electrical distribution depots in Bolton, Hanley, Newcastle-on-Tyne, York, Grimsby, Nottingham, and Huddersfield. By 1937 however, another depot had opened in Middlesbrough, but this coincided with the closure of the depots in York, Grimsby, Nottingham, and Huddersfield. The original site of the Gilbert factory at 75 Arundel Street in Sheffield, was eventually demolished, and the Sheffield Halam University now occupies the actual site where the factory stood. (As a point of interest, an old C. Gilbert & Co Ltd invoice in my possesion, dated 17th September 1936, shows the address as: "73, 75, 77, 79, 81, ARUNDEL STREET, SHEFFIELD, 1.) Hopefully soon, I will publish images of these historical documents in the gallery section--time permitting!! Gilbert gramophones were produced almost entirely in cabinet style, either "console" type designs, or "Pedestal" designs. The turntables and tone arms were mounted on a wooden plinth, under a hinged cabinet lid. The cabinets were manufactured in a number of styles, using mainly mahogany or oak, with one or two of the front doors acting as volume controls. Where only one door (or pair of doors in the case of a four door model) was for volume, the second door(s) typically gave access to the record storage compartment. An unusual feature on the "Model 55" is the "up & over" door mechanism, which works in the same fashion as a sash window. When the door is pulled down to open, the top section slides down behind the bottom section, which moves out of the way by means of a spring mechanism. As you will see from the reproduced sales catalogue for the "1927-8 Season", the retail prices for the various models ranged from as little as 6 Guineas (�6.30) to 30 Guineas! (�31.50) Gilbert also produced a "Portable Model" gramophone, and a highly unusual "double decked" version, suitable for, quote; "Use in Public Halls, Cinemas, Small Dance Halls and Schools"
Unfortunately, the sales catalogue does not reflect the change in styles from 1928 onwards, which saw an upsurge in the use of slatted sliding doors and electric (battery powered) needle lights (manufactured by EverReady). I have included a number of photos of my various machines, which show console mounted lights, which can be manually operated, or remotely operated by a rudimentary micro switch, and tonearm mounted lights, which are operated by a lever on the light fitting itself. Another unusual feature from 1929, was a lever operated "Volume Control" which allowed the user to open or close the two front doors by way of a lever, situated inside the front edge of the cabinet. This lever mechanism worked by way of a pulley system, so that when the lever (which was affixed to the first door) was operated, a "Cat Gut" string which was attached to both doors by means of two pulley wheels, pulled the opposing door in the opposite direction so that both doors opened simultaneously (similar to a pair of curtains!). Again I have included pictures of this model (No: 65) within the website. Another area of progression from 1922 was the use of different braking mechanisms. On the original machines from 1922, almost all used the common finger operated lever type brake, which relied on a spring strip to push a small leather pad against the edge of the turntable. From approx. 1924, when ball bearing mounted tonearms were introduced, the braking mechanism moved from the front of the turntable, to the rear, situated under the "arc" of the tonearm. The tonearm was fitted with a small "L" shaped rod which acted upon a "U" shaped brake lever, so when the arm was moved to play a record, the brake rod pushed the brake lever to one side, thus releasing the brake for the turntable to revolve. Consequently, when the tonearm was returned to its rest, the brake lever was pushed in the opposite direction and the brake was reapplied. By 1928, the tonearm had become more substantial in its construction and its size. The braking mechanism was also changed to a more sophisticated system known as the "Fully Automatic Stop" which was hidden under the turntable. This system, which was still operated by a rod affixed to the tonearm, acted upon the inside lip of the turntable, thus hiding the braking mechanism from view ( there is a period diagram of this system shown in the "gallery" section). In 1929, a number of Gilbert models featured extended tonearms to allow the tonearm to be mounted in the middle of the cabinet, the extension allowing the tonearm to reach the turntable! Up to this point, almost all tonearms were mounted above the turntable. Please see this feature in the pictures and description for "Model No:65"
One of the most unusual items in my collection is a Gilbert Gramophone/Radiogram, which was produced as an exhibition model for the 1931 Olympia Exhibition. The radio, manufactured by "British General", in features a 3-valve receiver, 16" speaker, and additional headphone socket. The cabinet has slatted front sliding doors, and is fitted with full size rear access doors. Restoration of this machine is now complete, including the radio receiver. Pictures of this machine are available on the Exhibition Radiogram Model Page. Gilbert also produced another line of gramophones under the name of "Geisha", again using widely available components such as Garrard turntable and motors, needle cups and brakes etc. The "Geisha" was more of an entry-level gramophone, and did not bear the same marks of quality and sturdiness which were the hallmarks of "Gilbert" marked machines.